Love this image all around, Fav'd. paul, not sure if anyone has noticed this, but in thumbnail form it almost looks like half a woman's face on the right side of the image. made me love this even more. Congrats Paul, great idea and lovely shot! Congratulations on the ribbon Paul. Absolutely love the location. All the items on the shelving in the background give it a great old time feel. Not many places left like this anymore. Processing is perfect. Wow. I love the old-timey feeling of this shot. Very well executed. i like this one a lot. nice work. congratulations. I'm so glad I didn't look for the shop -- because your shot is truly excellent, and there's no way I could come anywhere near this. Beautifully done -- congrats on the yellow! Congrats! Glad to see this ribbon; one of my favs. Congratulations Paul! 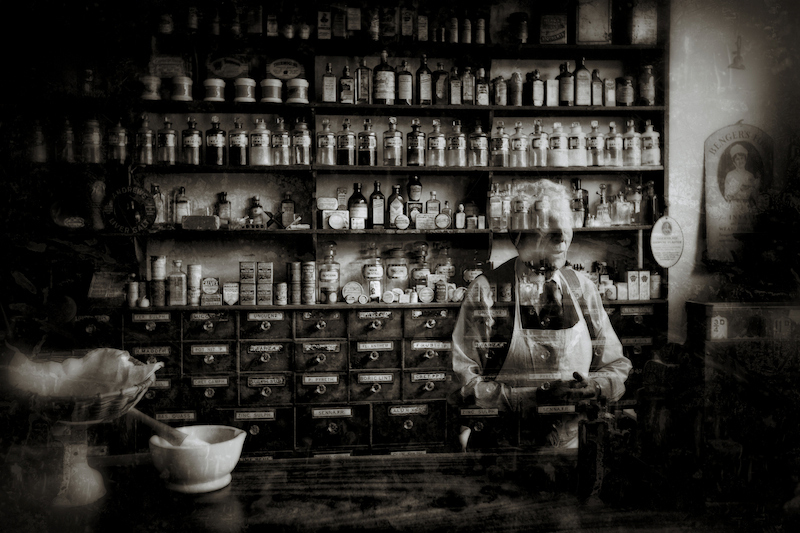 This Old Apothecary was a very clever choice for the set of your photo, it works just beautifully. There is also something reassuring yet nostalgic in how the ghost looks, fantastic mood. Keep up the good work. Congrats on the Yellow Paul, the more I look at this image the more I like it - there's a great mystery about it that I didn't see first viewing - unfortunately I didn't get time for a second pass or this would have been bumped to one of my top scores without a doubt. Love the feel and tone throughout the image. The man's eyes seem to be mixing with the bottles too much IMO. Great to see this at the top, well done again Paul. Beautifully done. A touch sad and nostalgic. Congrats on catching John with the ribbon, too! Congratulations Paul. Beautiful image with a lovely feel to it. I love the setup here, a local museum has a similar general-store setup that I wanted to make use of, hence my original comment. Huge congrats on the yellow, look at the company you're in! Congrats, I'm happy this got a ribbon, it is really a beautiful piece of art! Nostalgic and well done. Where did you find this? I like this one a lot. I think it would have been cool if he were looking into the camera. Absolutely excellent. I really love this one! i can't imagine how much time it would take to find this shop... and if you built it then well...holy. Very good setting, with a great figure to pull this off. Awesome. Top shot for me. Tones are perfect and everything in the scene seems old and slightly creepy. An effect of the tones you used I'm sure. This image in it's natural lighting would just be plain boring. This shot is one of my top 3 shots. EPIC WIN. This is perfect, meets the challenge and illustrates a very realistic manifestation of what I would vision a "ghost photo" to be. Awesome image, awesome location and subject too, so far in my voting this is blue ribbon all the way. The location and the details make the difference. Good work! Wow, this is so great. My favorite in the challenge! This is my favorite in the challenge! Really beautiful work, and interesting story. Not going to be voting, but I hope this does well and is on the front page. Proudly hosted by Sargasso Networks. Current Server Time: 04/22/2019 08:01:11 PM EDT.